Cathy Scarlet and Tom Feather were, by the time I read this book, familiar characters to me already. It is only in this book though that their characters were really introduced. I am a Maeve Binchy fan and I have read a number of her novels (read my reactions to Tara Road, and Circle of Friends. 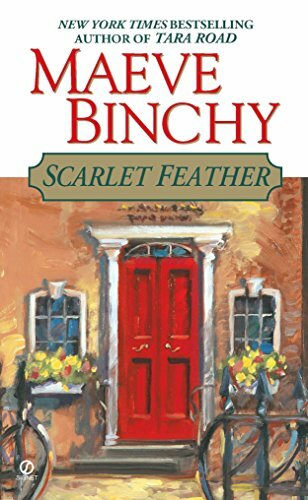 I also read Quentins but didn’t seem to have written about it), and at least in Tara Road, I remember Scarlet Feather making an appearance. It’s nice to have this specific novel really focus on Tom and Cathy this time around. I like both Cathy and Tom because they didn’t give up on their dream of setting up the best catering gig in town. I like that they are doing something that they both love and have such passion for. I especially love that they are in the food business. Someday, I’d like to follow suit. No, I have no dreams of cooking and catering lavish parties. But I do want to be a better baker and maybe make a living through it. Dreams. In the beginning of the story, we met a cast of characters that are as diverse as a bag of nips. One thing was certain though, both Cathy and Tom were in loving relationships with their respective partners. Forgive me for this spoiler (stop reading if you’d rather read of the outcome instead), but in the other books, Tom and Cathy were not only business partners but romantic partners as well. So I knew that Cathy was eventually going to divorce Neil, and Marcella and Tom would cease to be a couple. So all the while, I was waiting for the event that would signal their separation. And when it happened, I felt no sense of loss over Cathy’s marriage to Neil, or Tom’s gorgeous Marcella. To me, those couples were mismatched. They wanted different things out of life and the only thing that really tied them together was their love for each other. I never really believed that love is enough to keep any relationship going. So when it was apparent that they weren’t willing to immerse themselves in each other’s lives, it wasn’t going to work for long. Maud and Simon are young twins who figure prominently in the story. They are actually Neil’s cousins, but Cathy’s family ended up caring for them. Truly, their story shows how sometimes, it’s not your own biological family that will have your best interests at heart. They do mean well, and love you, but they just don’t have the capacity to care for you in the way that you need to be cared for. Sad, but it happens. But theirs also had a happy ending, of course. Like other Maeve Binchy novels that I’ve read and loved, this novel is an intricate weave of stories with a generous sprinkling of love, and allows a closer look at different types of relationships.